Magdalen Hospital was first referred to by Bishop Bartholomew in 1161. The reference implies that the hospital was already ancient in its origins. It has had many names over the years, in histories and on maps; Hospitalis Leprosorum (Oliver), Fratrum Leprosorum, La Magdeleyne, La Maudeleyn, the Mawdlene, Mawdelyn, or Maudlin, or simply the Magdalen Hospital. It was opened as a house of lepers, to isolate the inhabitants from the city. Leprosy was probably brought back to England by pilgrims returning from the Holy Lands. The hospital was situated in Bull Meadow, and consisted of a quadrangle with a chapel on one side and small buildings to house the inmates on the other three. Inmates were confined to the hospital and could be punished with a stint in the stocks if found wandering in the city. In 1163, Bishop Bartholomew Iscanus granted a charter for the inmates of the hospital to collect tolls on all corn and bread sold in the fairs and markets of the city. In addition, they were allowed to collect door to door alms, every Tuesday and Thursday. At this time there were thirteen inmates of the hospital. In 1244, the hospital was transferred to the Chamber. After complaints from many locals, of the danger of infection from leprosy, the concessions of collecting tolls on corn and alms were removed, and all further relief was refused. Leprosy did not respect rank and Richard Orenge, Mayor of Exeter in 1454, contracted the disease and was confined in the hospital in 1458. He remained there until his death, when his remains were buried in the chancel of the chapel. According to Jenkins, a plaque was still in existence when he published his history of the city. Through the years, many of the rich and good bequeathed to the 'lazar' people of the hospital, annuities or other gifts. John Baker left 3s. 4d. yearly, Robert Chafe, Esq, (sometime Mayor) bequeathed 14s. and John Tuckfield left an annual sum of 1s 8d. The Dean and Chapter were required to pay £2 12s annually. Bishop Bartholomew (1161–1184) left the gavel (rent) of property at Morchard Bishop, near Crediton, and the bark of the wood from his land at Chudleigh. 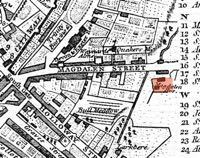 Jordan Bestelebise gave the income from land adjoining the City stank or fishpond known as 'Mawdlyn Lake'. There were many other bequests and gifts to support the hospital over the years, including the income from a mill, many houses and land. It would seem that the good citizens of Exeter were falling over themselves to ensure the hospital had sufficient funds, and they had a secure pathway to heaven. Leprosy, as a tropical disease started to decline as fewer journeyed to the Holy Land but there is evidence to suggest that some cases of leprosy were still being admitted in 1530. 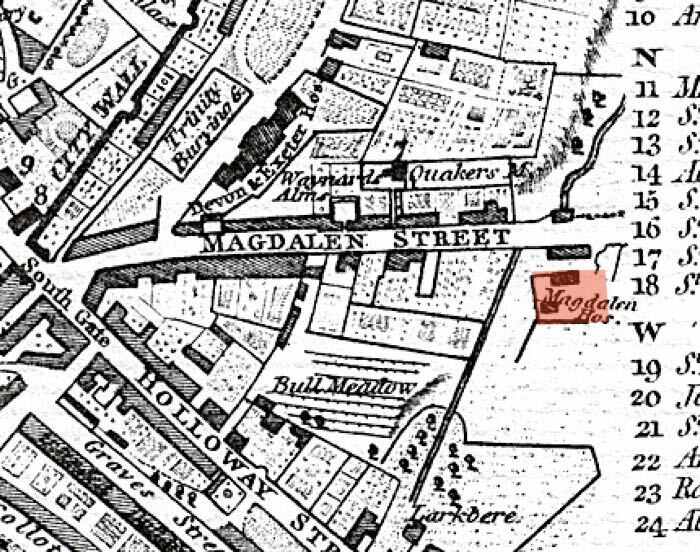 When first founded, the hospital stood in the small valley of the Shutebrook, next to where Magdalen Street became Magdalen Road; the street was named after the hospital. In 1599, the road in the valley was "filled up and paved" according to Jenkins. After this work, the road was not as elevated as now, for it was the development of suburbs in St Leonard's that saw the road raised to its present height. According to Jenkins, by the time of his history in 1806, the chapel had been desecrated "and kept in a filthy condition, no glass being in the windows; it still has one bell, and some mutilated grave-stones, with broken inscriptions." 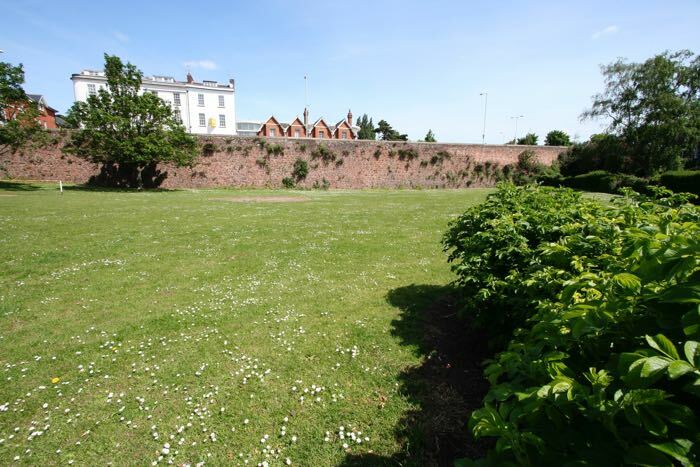 The hospital gradually reverted to housing poor families and the destitute, when in 1835, the Municipal Corporations Act saw the the running of the hospital transferred from the Corporation to the Exeter Municipal General Charities. By 1863 the buildings were derelict and were demolished. Source: History of the City of Exeter (1806) by Alexander Jenkins The website british.history.ac.uk, Remarkable Antiquities of the City of Exeter, 1741, by Richard Izacke. Map drawn by Roper 1805, shows the position of Magdalen Hospial in Bull Meadow. The hospital was in the top right corner of this photo.